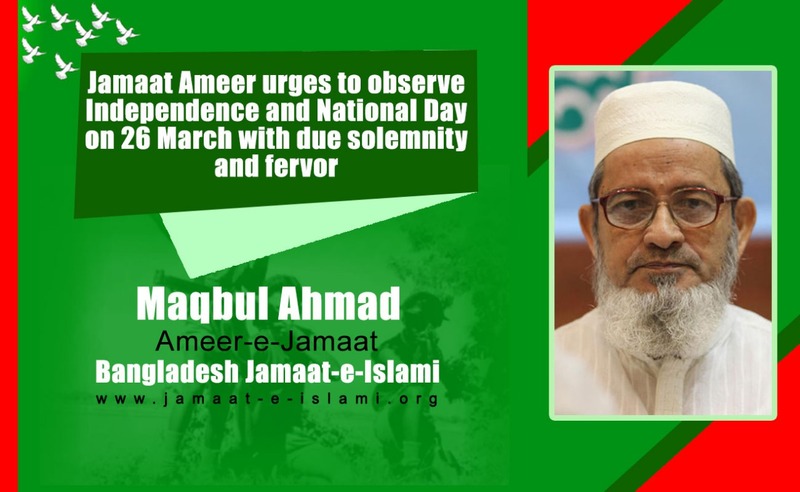 Bangladesh Jamaat-e-Islami’s Ameer Maqbul Ahmad has issued the following statement on 24 March 2019 urging to observe Glorious Independence and National Day on next 26th March with due solemnity and fervor. The Independence and National Day is going to be observed on next 26 March. The day upholds extreme importance and significance in our national lives. We have achieved our independence by dint of the sacrifice of our valiant freedom fighters and the fellow countrymen. The people had expected that democratic rights, voting rights and the rights to survive would be established and secured following the war of independence. But regrettably, 48 years has been elapsed, we are still struggling to enjoy those rights. The incumbent government has snatched people’s voting rights away. The country in now days is experiencing farce in the name of election, along with unchecked corruptions, terrorisms, looting, murders, rapes, abduction and enforced disappearances. Bangladesh has turned into a reign of terror and anarchy now. For the sake of national welfare and prosperity, there is no alternative but forming national unity and the establishment of democracy, justice and rule of law. But the government is pushing the nation towards divide and division by destroying the electoral systems. They have sent democracy in exile by holding farcical elections repeatedly. To get rid of this situation, we all have to be united irrespective of our political position and opinions. The ruling authority has pushed the country towards darkness by promoting corruptions, misrule, nepotism and also by seizing the judicial freedom and the freedom of speech. Continuous oppression and crackdown are going on against Islam and the Islamic values. The religious scholars and veteran personalities are not spared from such tortures. We have to launch unified movement to enjoy the true taste of independence. The dream of independence will be materialized through the broad base unity of the people. I am urging all the units and front organizations of Bangladesh Jamaat-e-Islami to observe Glorious Independence and National Day on next 26 March with a vow to establish democracy, voting rights, national unity and rule of law in the country.